The Metropolitan Train of Santiago, best known as Metro, is the main transportation in the city. It connects the most populated zones of Santiago, and operates from 6:00 AM to 11:00 PM. Metro de Santiago map close-up. San Joaquín Station highlighted in red. The San Joaquín Campus is located next to “San Joaquín” Metro Station (Line 5). This makes of Metro the most common transporting system for students and professors travelling to and from the campus. Please, note that in Line 1 you may find “Universidad Católica” Metro Station, but this is NOT the station near San Joaquín Campus. Remember at all times that the Conference will take place at San Joaquín Campus, and that the metro station next to the campus is also called “San Joaquín” (Line 5). Peak hours are 6:30 AM-9:00 AM and 5:30 PM-9:00 PM, Monday to Friday. During these hours, Line 5 trains operate in Express Service mode. Metro stations are marked as Red or Green. A red or green light at the first car of each train indicates the colour of the station at which it will stop. 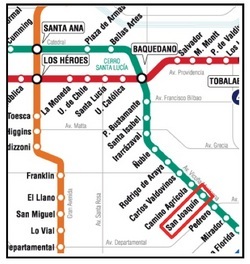 San Joaquín Metro Station is marked as RED, therefore, at rush hours you should pay attention to take red light trains only. At off-peak hours, all trains stop at every station, regardless of the colour. What to do if you take a train of the wrong colour? There are a few stations marked as both, Red and Green. Red and Green stations nearest to San Joaquin Metro Station are “Irarrázaval” (five stations before) and “Bellavista de La Florida” (three stations after). We invite you to visit the Traveller Guide (Guía del Viajero) at Metro web site: http://www.metrosantiago.cl/guia-viajero .There you will find a travel planner tool, which may assist you to best organize your ride. Bip! cards are “Pay per ride” cards, which are sold at every subway station, “Bip! Centers” (Centros Bip! ), and some small business. You may use Bip! cards to travel by bus and/or by metro. You get an automatic free transfer between subway and bus, or between buses, within 2 hours of the first use in a one-way ride. Bip! cards are easy to use, you only need to touch the screen on the farebox located on the turnstiles of every bus and metro station. Bip! cards cost CHP 1,300 (mil trescientos pesos, about USD 3). In order to start using it in a bus or metro ride, your card will need to be refilled with, at least, another CHP 1,000 (mil pesos, about USD 2). Refill it as often as needed. We encourage you to visit the Price List at the Metro’s web page to know the current cost of your ride and transfers: http://www.metro.cl/guia-viajero/tarifas (page available in English). a. Troncales are big, white buses with a green stripe on the sides, travelling long distances and crossing several zones. b. Locales are small, coloured buses (other than white), travelling only inside its colour matching zone (see Figure 1). Campus San Joaquín is located in Zona D (see yellow zone in the map below). 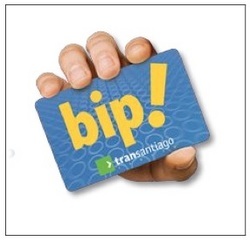 If you want to travel by bus (“andar en Transantiago”) you will have to buy a Bip! card. a. Taxis: black cars with a yellow roof. Taxis are comfortable, air conditioned cars, and are available at any time and place. They have a cash-only payment policy, and the fare is regulated by taximeter. b. Colectivos: fixed route, flat rate cars. Also cash-only payment policy. By travelling in a colectivo, you accept to share the car with up to three other passengers. Colectivos are black-only cars and you can recognize them by the route-displaying signboard on their roof. Schedules vary from route to route.